If you’re an avid reader of our Pin Up girl stories, then you’ve probably seen my many references to Retro Lovely Magazine. We all love cars, and we all love Pin Ups! MyRideisMe has got you covered in both departments. Pin Up beauties have been gracing the pages of MyRideisMe for quite some time and we’re happy to bring them to you along with great pics and interviews… but sometimes, a picture on the web is just not enough. You can’t hang your computer on your wall or toolbox! If you need more Pin Ups in your life, look no further than the pages of Retro Lovely. Retro Lovely is a Pin Up and retro magazine, featuring photos from the industry’s top photographers, like our friend Mitzi and Co. So far the cover shots have featured Pin Up mega stars like Masuimi Max, Mosh Modela and Gia Genevieve. Trust me, there’s much more great content inside, and many more fantastic issues to come. This is the perfect magazine for Pin Up fans who love top quality Pin Up imagery and style. The first time I picked up a copy I was blown away by the quality of the magazine itself. Over 100 pages per issue, printed on thick, heavy, photo quality paper. There’s a clear difference between this magazine and others on the market. I’ve even seen photo books, that weren’t up to par with the quality of this magazine. Each magazine is unique and each has something to offer, but this one’s my favorite and I look forward to every new issue. Have a look at Retro Lovely Magazine and view photos of your favorite Pin Up models printed in vivid color… what a difference! You have to see it to believe it. I said it before and I’ll say it again, I believe this to be the best Pin Up magazine out. With issue #4 due out soon, Retro Lovely has kept customers happy… so happy that almost every issue has sold out. You can purchase your copy of Issue#4 now, but don’t forget to pick up the prior issues including the Taboo edition, which includes all the hot and steamy images Retro Lovely has to leave out of the regular issues. You don’t want to miss out on that! MyRideisMe is thrilled to announce our collaboration with Retro Lovely Magazine to bring you the best pinups and… together we’ll be hosting a pinup contest. The winner of the MyRideisMe.com pinup contest will be featured in a two page spread in the 5th issue of Retro Lovely Magazine. 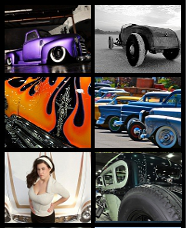 We are currently accepting ‘car themed’ photo submissions until March 7th. Send your submissions to moc.emsiedirymnull@tsetnoc. More details to come, but we’ll be requesting participation from our members and online community to cast your vote for your favorite girl. on our Facebook Fanpage. For now you can mosey on over to RetroLovely.com and check out my video review for issue#3, and purchase your copies in their online store. Use coupon code MRIM to save $2 on your copy today. My Ride is Me + Retro Lovely = Awesome!! Yeah…what Ang said! Two thumbs up! Notorious Ang and the ’39 Lincoln Zephyr are what I live for. I hope that coupe has a V-12 Flattie in it. Ang is perfect they way she is. Sigh.